Back in 1994 I read a book called “Complexity – The Emerging Science at the Edge of Order and Chaos”. In this book the author suggested that theoretically complexity should not really occur naturally because it seems to defy the Second Law of Thermodynamics (SLOT) and the concept of maximizing “Entropy”. “So?…” you might well ask. Have I managed to formulate any sort of an answer to this tricky and paradoxical question? Well yes, I think I have. The answer to why physicists believe what they do is simply a matter of history; but the answer to what’s driving evolution is much more interesting…. In the simplest possible terms, the SLOT is about the spontaneous pull of thermal equilibrium, and so it effectively about how the SLOT operates like a natural “Negative Feedback System” (like a natural thermostat) in that it pulls (or dampens) a system to the equilibrium state. However a fact that has been consistently overlooked about the physical behavior of the “Second Law of Thermodynamics” is that it relies heavily on the mathematical behavior of the “Law of Large Numbers (LLN)”. The LLN essentially says that a very large number of independent things will most likely exhibit the “Most Probable Distribution” — which in thermodynamics is the equilibrium state. Consequently a system can be held away from thermal equilibrium by two things. Firstly, the negative feedback effect of the LLN can sometimes not be strong enough to dampen the system to equilibrium. And secondly, the strength of the LLN can sometimes be weakened by a reduction in the independence of the elements within the system. So these two things can in effect act as resistance to the pull of thermal equilibrium. But moreover, and more interestingly, it is the interplay of these two types of resistance that can (without any external direction) naturally drive evolution away from a featureless state of thermal equilibrium, to some extraordinarily creative complexity. Moreover, and this is what is really interesting, both of the above matrices can also be represented in terms of thermodynamic entropy and “Information Entropy”. So while most people might think about evolution in terms of “an ecosystem of plants and animals”, the reality is that plants and animal (and the ecosystem itself) are really just “information structures”, and evolution simply keeps creating evermore complex information structures. Over the last 400 years or so Mathematical Physics has become the science that we rely on to explain the behavior of the universe. Mathematical physics is the ultimate science of “deterministic/predictable” cause and effect. In general, The Science of Physics likes to believe that all dynamics, all natural behavior, can be explained mathematically; and consequently physicists like to build “mathematical models” of (cause and effect in) the real world. Sometimes these models are unbelievably concise, and can be expressed as a neat linear differential equation, and when this happens we confidently call the model a “Deterministic” “Law of Physics”. It is precisely because of these so-called “hard and fast scientific laws” that physicists like to describe their science as the hardest of “hard science”. This of course would seem to imply that many of the so-called “soft sciences” are in some way not quite as elevated, not quite as good. In truth however we could say that physics is an “easy science”, and the soft sciences are “difficult” because the “laws” of physics only really work in the absence of “noise”, and yet the soft sciences are condemned to deal with our everyday world which is full of noise — because virtually everything in our everyday world is continually battered and buffeted by “constantly changing feedback” which can generate wild “nonlinear dynamics”. In reality all dynamics have feedback (and resultant nonlinearity), it is just that some dynamics have much less feedback than others. Physics is, in a sense, the science of the nonlinear stuff that can be safely “compressed into the neat linear mathematics of cause and effect”. In other words; Physics is primarily a science of “linear” dynamics, a science of dynamics “without feedback” (or more realistically a science of dynamics with negligible feedback). Such dynamics are indeed easily compressible, but our real world is a world that abounds with feedback, a “nonlinear” world full of “incompressible dynamics”. It could be said that throughout its 400 year history physics has had great difficulty dealing with non “linearizable” dynamics, because these wild dynamics are messy, mathematically unstable, and consequently difficult to predict. Turbulent systems are the most obvious example. Turbulent systems are mathematically non-linearizable because they have lots of of internal instabilities due to the excessive amount of “energy” in the system. More recently (in the last 40 years or so) we have started to become more aware of other types of systems that are mathematically non-linearizable. Complex Adaptive Systems (CAS) are systems whose elements are not completely independent of each other and consequently they can exhibit a lot of internal instability due to the excessive amount of “adaptation” in the system. The economy is the most obvious example of a CAS. And so while economists might like to think they can build mathematically models of the economy, this is simply not possible, because the economy is mathematically non-linearizable and full of incompressible dynamics. In the coming years many more people will begin to understand the difficulty and inherent uncertainty involved in dealing with CAS’s. 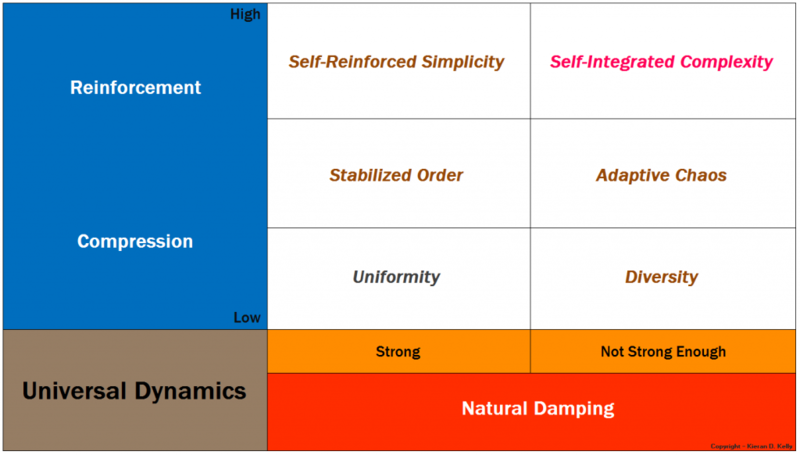 As our world becomes ever-more interconnected and co-dependent, more and more systems will become adaptive and complex, and will consequently exhibit incompressible dynamics and unpredictable “emergent behavior”. And so in the future we will all have to learn to live with uncertainty. But in case all of this seems overly pessimistic, fear not, for there is another side to CAS. Complex Adaptive Systems may be unpredictable but they are also massively “Creative”.